to book a group course experience. This foundation course is a tried and true method presenting the basic elements of drawing and watercolor with personal coaching. • and encouragement to support your experience. "I'm such a face-to-face communicator, I never thought an online environment could be effective for teaching. I never thought I'd like the video format. But in your online course, I'm not distracted by extraneous things that would otherwise catch my attention. Even better, I don't have to drive anywhere! "I feel like it's the benefit of private tutoring with the advantage of other students' work to look at. You've put together a really well-planned, well-thought out, beautifully presented product with tremendous depth and breadth. is how the process and practice of learning is a path to self realization. As you learn to draw and watercolor — you learn about yourself. through a transformational process that forever changes the way you see the world. with your personal evolution in mind. Transformation means to undergo a marked change in form, nature, or appearance. It means that you change and it's noticeable. To evolve simply means to develop gradually, from a simple to a more complex form. and to recognize and bypass your self-critical thoughts. with your drawing and watercolor practice. Overcome your fears and your blocks on paper in the privacy of your own home. Maybe you don't want to be an artist. Or you do want to be an artist. Or you are an artist and feel that you've missed a critical link. The truth is that many people - even practicing artists - miss a good foundation in basic elements and principals and suffer for years as a result. Are you afraid to start drawing and watercolor because you tell yourself (and others) that you have no artistic talent, can't draw a straight line but secretly long to paint and maybe even have a stack of untouched art supplies in a closet? Forget about talent. EVERYONE (and that includes you) has the right and the ability to pick up a pencil and draw. Everyone has the right and the ability to learn about color. My foundation courses start at the very beginning and encourage you to play and be imperfect to help you get your pencils moving and brushes wet. 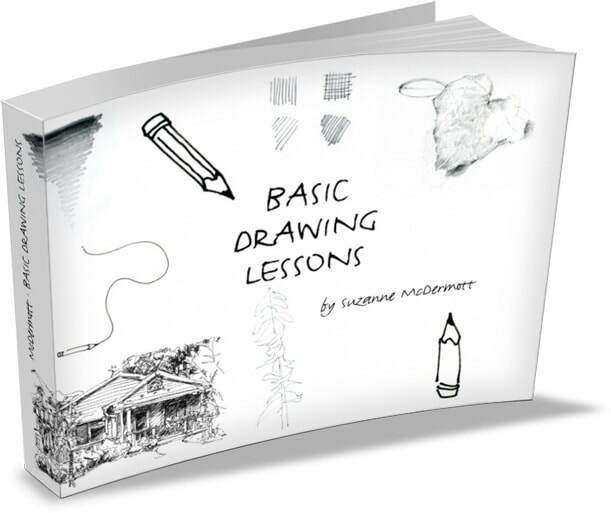 So, learn the fundamentals of drawing and watercolor and, more importantly, become better acquainted with yourself. Allow me to guide you through tried and true progressive exercises, designed to encourage your natural tendencies and help you establish the habit of practice. Learn to draw and watercolor like YOU, not like anyone else! Connect with your authentic, creative self. Recognize your blocks and foibles (common to all of us), learn how to step around those and better connect with your experience in each present moment. You'll experience remarkable change in the quality of your life while making drawings and watercolors. Read my Frequently Asked Questions page. Read about the RESULTS from other student's experience. "I will never look at the world in the same way again!" As you learn to practice drawing and watercolor, you naturally develop your awareness, observational powers and problem solving skills. Inevitably, these and other benefits that come with the practice of drawing and watercolor enhance your life in positive ways that will surprise you! You don't need any experience to take any of my courses. All you need is a desire to draw and watercolor. My courses are designed for closet (or shadow) artists, and for professionals outside the visual arts. Read about the RESULTS and learn about other student's experience. Join this encouraging online course and discover your untapped creative potential. It's just like being with me in my studio! In the privacy of your own home or work environment. Your course results will help you expand your consciousness, learn about your true self, revel in the world of color, the world around you, to become more mindful, more present, more observant, to feel accomplished, to develop your creative nature and discover new natural abilities. Your course includes a direct link to all recommended materials. "If you hear a voice within you say, "You cannot paint," then by all means paint, and that voice will be silenced." ​is a way to open our eyes, open our hearts and love as we learn to observe. Observation allows us to understand and see a person, thing or place more clearly for who, what, where it truly is, rather than our preconceived notions of what we think we see. Become one with the world around you as you learn to see through drawing and watercolor. ​to book a group course experience. Just want to start drawing? ​One thing leads to another.